The Green Spot brand was originally known as Pat Whiskey, with a man looking very much the worse for wear. Behind him was dark green shading. From this image grew the name Green Spot.The current Green Spot is made entirely from 7 and 8 year old Midleton pot still, 25% coming from sherry cask, which is evident in its aroma and taste. Only 500 cases are made each year, with most of this sold through Mitchell's shop. Green Spot is the oldest continuously made pot-still Irish Whiskey. It is distilled by John Jameson & Son for long established Dublin wine merchants, Mitchell & Son. 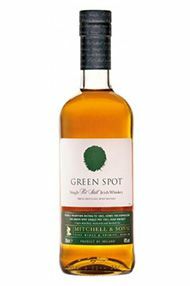 Green Spot pot still whiskey has been produced since the turn of the 19th century. It is currently the only brand produced and sold under name specifically for an independent wine merchant in Ireland. The last from a range of "Coloured Spot" whiskeys. Only 500 cases are produced each year.